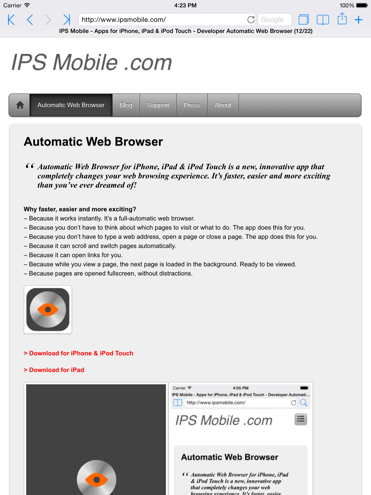 Automatic Web Browser for iPhone, iPad & iPod Touch is a new, innovative app that completely changes your web browsing experience. It’s faster, easier and more exciting than you’ve ever dreamed of! Why faster, easier and more exciting? – Because it works instantly. 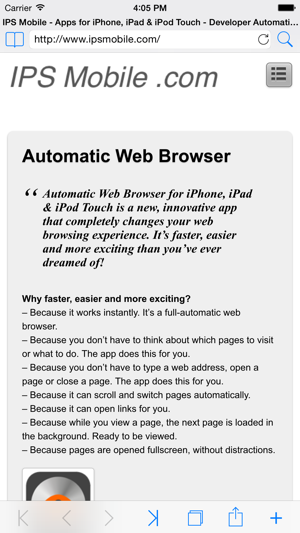 It’s a full-automatic web browser. – Because you don’t have to think about which pages to visit or what to do. The app does this for you. – Because you don’t have to type a web address, open a page or close a page. The app does this for you. – Because it can scroll and switch pages automatically. – Because it can open links for you. – Because while you view a page, the next page is loaded in the background. Ready to be viewed. – Because pages are opened fullscreen, without distractions. 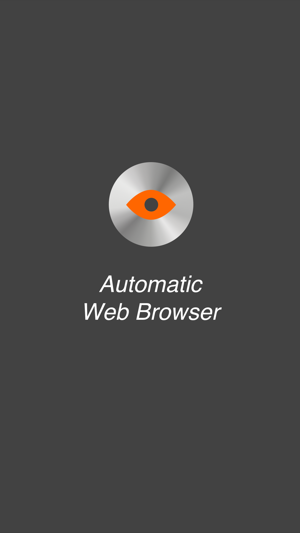 We’ve tried to get as close as possible to the ‘ideal’ web browser. Making it fast and easy to use while keeping it personal and private. Besides that it’s a full-automatic web browser it makes interaction as easy and fast as possible. 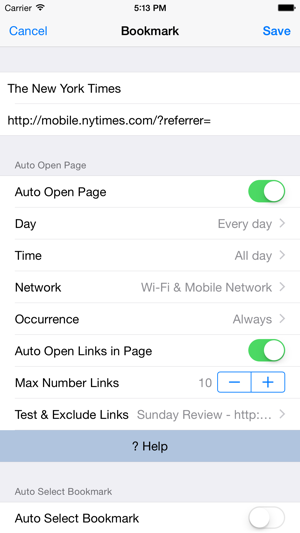 – You can start and stop automatic scrolling and switch pages with gestures. – It selects a shortlist of bookmarks that’s most appropriate for that moment. – It features multi-open. 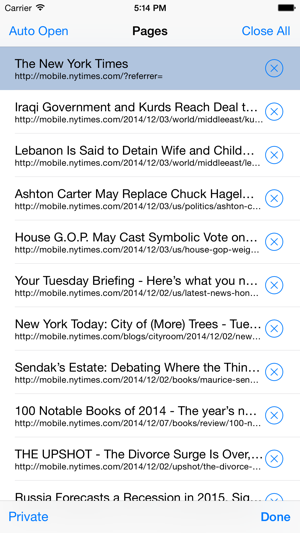 Select websites and folders from your bookmarks and open them at once with the touch of a button. – You bookmark websites you want to visit frequently. Set when you want to see it. At which day, time, network (Wi-Fi and Mobile Network) and occurrence (always, once a day, once a week, once a month). – Links from the bookmarked page can be opened automatically. You can set the number of links and run a test. A special algorithm gets the most valuable links from the site. You can exclude links you don’t want to be opened automatically. – At startup (or by tapping a button) the app can automatically close pages, open pages, load pages, scroll, open links and switch pages. It’s awesome! – The browsing experience is highly configurable. You can for example set the scrolling speed, turn different options on or off, set the time the pages need to be opened and the number of old pages that need to be kept. – The app can do bookmark suggestions for you, based on the browsing history. – Some of the other features we’d like to mention: private browsing, multiple search engines, lock rotation, sharing links via Twitter, Facebook or E-mail, automatically open folders with pages, etc. Don’t miss the benefits, power and new possibilities from this app and download it. You won’t be disappointed!